The hours are tense and spirits frayed. The Metropolitan police is becoming aggressive, protesters also. The government keeps up its increasing inanities. Foreign and national condemnations keep arriving and chavismo can only speak of an international conspiracy. If there is such a conspiracy then it is truly impressive as can be seen from this link who only reports the main ones. Threats are emitted by the government. The stupidity and nervousness of certain of Chavez lackeys such as Maria Alejandra Diaz is amazing as they openly threaten to close for 72 hours Globovision while the whole world is watching the closing of RCTV. Tension rises as the country is turning at midnight yet another page in its descent to hell. Those who actively support the closing of RCTV and the end of freedom of information should remember that such crimes can be prosecuted as long as they will be alive. This blogger will be sued by William Lara, the unqualifiable minister of the popular power for information, a.k.a. propaganda ministry. The man had the temerity to say today that any media that says that RCTV is closed by the government will be sued because we are lying. The interesting thing in that accusation is that even reading the words of Lara is enough to realize that the man is losing his wits, that the knows he lost the propaganda war and thus, in true fascist form, he is getting ready to shoot the messengers by punishing them. I love it, IN FRONT of the eyes of the world! At 7PM, Marcel Granier is on TV with a statement and followed by a press conference. It is 9 PM and the press conference was great. Granier told all what is wrong with the Chavez administration. He is now threading into direct politics. Chavez is creating him. Astounding. Even in San Felipe we are hearing sirens and pot banging. 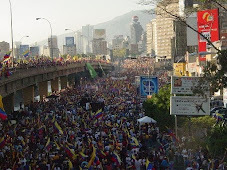 But very little, we are always weeks behind Caracas. It is actually surprising that I hear some!